I want to track a shirt that I made with 3 distinct colors on it. Red, Blue, and green. You helped me with this about a year ago but I have not touched it since. With all the upgrades the file does not work anymore and I cannot figure out how to set it up. Can you please help. I'm attaching a still photo and what I think is the robo file that used to work. The idea is for the robot to follow me around so I need the center of mass of the shirt. I think I have it working, at least with a still pic, I'll test the video later. The robo file is attached. Is there a way to do all the processing then show the results on top of the live image? Right now at the end I get a black screen with a COG box and the coordinates, but it would be nice if that was drawn on the original video. Is this possible? Why not you use a single color shirt it will be simple. Because a single color shirt would confuse the robot any time I walked past an object nearly the same color. If it was a green shirt I would have to avoid anything green. 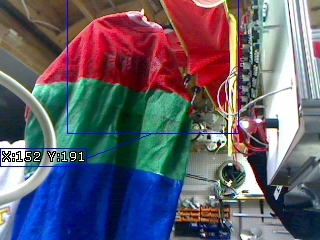 However with this setup the robot only sees objects that are green and have Red And Blue touching the green. Still not perfect, but better. Do you have any other picture with little better picture quality or the original one. in the COG module which will get you back the original image with the COG overlay.